While it’s always been considered a bit of a surprise if a baby would inherit its mother’s eyes, or its father’s dimples, we’ve been fairly confident in the idea that everyone gets their mom’s mitochondria. Mitochondria, organelles in your cells responsible for providing them with energy, are made according to their own packet of DNA, called mitochondrial DNA (mtDNA). This is distinct from your body’s nuclear DNA, and since it was thought to only be heritable from an animal’s mother, had smaller degrees of variation between generations. This made it an attractive tool for tracking populations and familial lineage, but that may soon be complicated thanks to some persistent genes from a particular rooster. A family of White Plymouth Rock chickens was recently found to be breaking the rules, with genes from roosters’ mtDNA turning up in their offspring. This was determined thanks to a mutation in the ND4L gene was found to have originated in a rooster after it was found turning up in his chicks mitochondria. This isn’t the first time this has happened, as plants, sheep and one human have been documented with similar genetic activity, but the relatively small number of chickens required to uncover it has raised eyebrows about how common this kind of activity may be in the wild. In mammals, the mechanism that prevents a father’s mtDNA from being passed is fairly clear. When sperm fertilize an egg, the sperm’s mitochondria are usually destroyed. Even though the nuclear DNA can still be shared to recombine into a new embryo, the mtDNA is basically removed from the equation, leaving the mother’s mitochondria as the only possible donors of genetic information. If this reliable mechanism isn’t actually so iron clad, it may impact a variety of studies. Anthropologists have used mtDNA to trace family backgrounds, as well as large scale historical migrations. Outside of science, mtDNA has been deemed reliable enough to be entered as evidence in criminal trials. 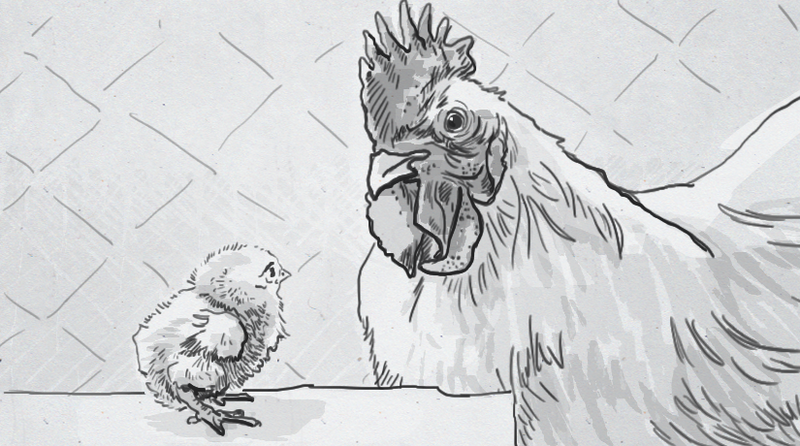 Unexpected rooster genes don’t throw all this out the window, but they do indicate that some closer reviews of how often fathers contribute to mtDNA be conducted so that future research can account for such variability. When evolution transforms an organism, it generally doesn’t create a new structure or tissue from nothing. While a mutation can cause a new structure to grow in an animal, even that requires some genetic information to be in place, which is then modified, not invented. With enough time, these changes can be dramatic, pushing snouts into beaks, fingers into clamps, and fins into wings. Some of those mutations have now been isolated in skates and rays, explaining just how they stopped looking like sharks and became the unusual fish they are today. 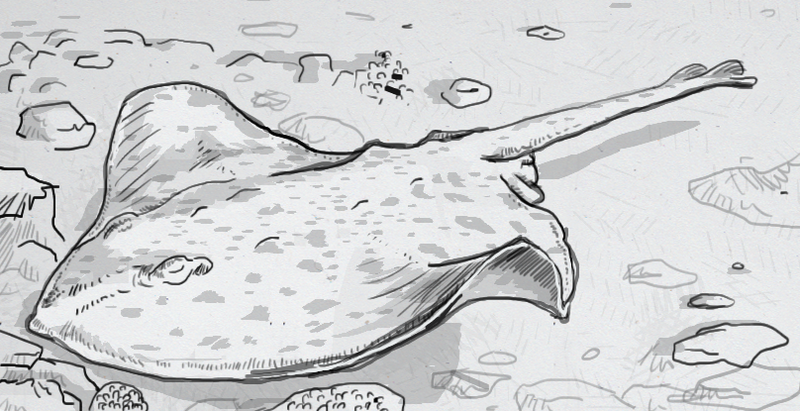 Skates and rays, as members of the batoid suborder, are noted for their winglike fins along the full-length of their torsos. They evolved as an offshoot from a shark ancestor, with reshaped propulsion allowing them better movement along the sandy floors of river and seabeds. Instead of fins that stick off most fish like limbs, batoid fins nearly surround the animal. Larger bones attach behind the animal’s head, extending both forward and back, parallel to the torso. From those “limbs,” a halo of smaller digits extend and provide structure and facilitating the fluid, undulating movement batoids are famous for as they swim. The junction where the larger bones attach was the focus of recent study trying to find the exact change in the animals’ DNA that created this fin structure. The growth of embryonic skates was studied, which helped reveal when the fish changed from your standard set of flippers to flattened, surrounding wings. The crux of these changes were basically in two sets of genes. The first were the 5’Hox family of genes that lead to the half of each wing that grows from the “shoulder” back towards the tail. There wasn’t enormous changes in these genes from a sharks’, and if you cut a skate’s wing in half, you’d have a much more commonly shaped appendage. The front half of each wing is possible thanks to more drastic changes to the 3’Hox genes. Rather than being part of the same ancestral fin the back portion of wings grow from, the front portions were found to grow from what had once been a shoulder region. A very different piece of DNA was basically re-purposed to grow these uniquely-shaped limbs, which then grew to appear as a single, cohesive structure. As unlikely as separate-but-melded-fins sounds, if you’re making tiny changes over millions of years, they’re still easier than inventing novel fins from whole cloth. While tardigrades seem like some weird outlier of the world’s genetic soup, much of their weird abilities may come from the fact that they’re actually blending a number of genomes together. These tiny creatures, also known as water bears, live in a huge range of environments, from ocean crevices to Antarctica to, at least temporarily, the vacuum of space. They survive both hot and cold temperatures, toxins and radiation in doses that would kill much larger animals. They can even be dehydrated for up to ten days, and then be revitalized with a bit of water. This extreme survival tool kit isn’t found in any other animal, but it could very well be assembled from snippets of DNA the tardigrades have borrowed from other life-forms. Horizontal gene transfer is the process wherein an organism acquires DNA from a different species, versus inheriting it exclusively from it’s parents. It’s usually associated with microorganisms like bacteria and bacteriophages, and can drive rapid adaptation by making large changes to a genome in one fell swoop, literally inserting new genes from a neighboring creature. 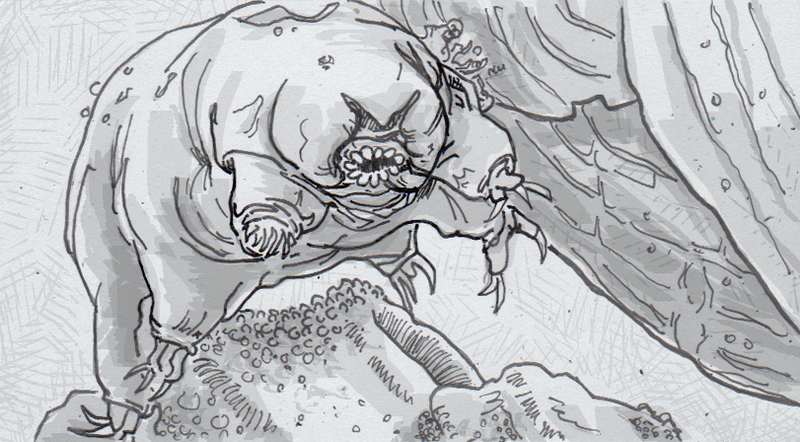 Tardigrades, as creatures used to extremes, seem to have taken this idea and really run with it. Genetic analysis has found that one-sixth of their DNA actually originated from bacteria, plants, fungi and archaeans instead of a strictly tardrigade family tree. Appropriately, this makes tardigrades the current record-holder for horizontal gene transfer, and there’s a good chance they’re still at it. The amassed genes seem to be primarily bacterial in origin, which may actually help answer some questions about tardigrade ecology. Many species of bacteria are known to survive in extreme environments, like Thermococcus litoralis living on thermal vents on the ocean floors. There’s a chance that some of the acquired DNA in the tardigrade genome are allowing it to copy the environmental tolerances of these bacteria. While the piles of borrowed genes may eventually explain the origin of the water bear’s list of abilities, it raises the question of how they got started on this path in the first place. Many animals, including humans, do borrow genes laterally from other species, the 17.6 percent of borrowed DNA in a tardigrade indicate it has a special aptitude for this process. One possible explanation is tied to their ability to survive desiccated, or completely dried out. While they’re not much worse for wear after being re-hydrated again, there is some temporary damage to their cell membranes. It’s possible that genes from neighboring organisms have gotten slurped up while the cell repairs itself, making the tardigrade not just restored, but actually enhanced in the process. Update: A follow-up study casts a lot of doubt on the 17.6 percent of borrowed DNA, saying it was likely due to bacterial contamination during experiments. They’ve put the figure at a much more pedestrian 1 percent instead. Oh well. If you take my children’s word for it, they have the most sensitive taste-buds known to man. When presented with a new food, the taste receptors in their mouths can apparently sample the very air in the room to determine that no, this can’t be as good as Mac ‘n’ Cheese, and therefore should not be eaten. These sensitivities don’t leave them with many options though. Watching the kids not eat sometimes makes me wish they were more like Japanese macaques, who’s lack of taste has made managing their diets significantly easier. The Japanese macaques (Macaca fuscata) are the monkeys often seen warming themselves in natural hot springs. They usually dine on various plants and fruits found in northern Japan, but a group on the island of Kii may have given themselves a bit of a leg up some time in the last 13,000 years. 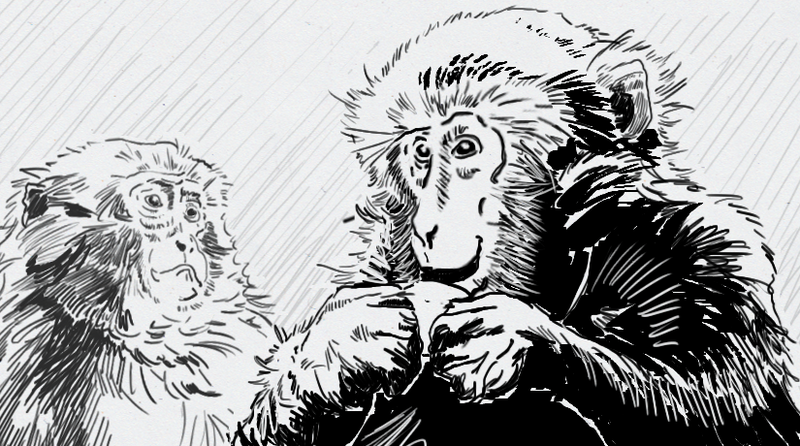 A subset of the monkeys have been found to carry a gene that essentially breaks the TAS2Rs-encoded taste receptors in their mouths. This means they can’t taste bitter flavors as well as most of their brethren, which leaves them at greater risk of missing toxins in their food. It also means that they don’t need to worry about that when eating safe but bitter foods. This dynamic really started to play out around 2,800 years ago, when the tachibana fruit was introduced to Kii. Ripe fruit is enjoyed by most Japanese macaques, but immature tachibana has thicker, more bitter rinds that the monkeys will reject because of the unpleasant taste. The group with fewer working bitterness receptors don’t taste the strong flavor of unripened fruit, and since it’s not actually toxic, they can enjoy the additional food source for themselves. As Japanese farmers have brought other bitter plants to the, the monkeys with the “broken” genes are getting even more of a boost, as they can steal food most other animals would avoid. Other animals like my kids and their over-productive TAS2R genes. When you think of a “dairy cow,” you probably picture a large animal with black and white spots, pronounced udder and maybe some small, curled horns. This breed, called a Holstein, is the source of the majority of milk consumed in the United States, and is able to do so thanks to generations of selective breeding for better milk production. There’s now a new push to adjust their breeding further, not to increase any properties of their bodies but to actually remove some anatomy entirely— their horns. 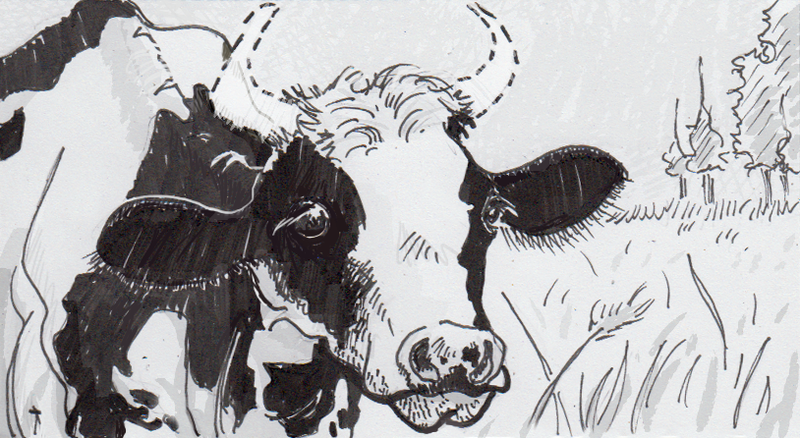 Cows have been altered significantly since they were domesticated. Their wild ancestors, the Auroch, was a more athletic, large-chested animal, as tall as it was long. Significantly, they had large horns and small udders, barely visible even when a cow was pregnant. Selective breeding by humans have obviously reshaped the species into a variety of domestic breeds, with Holsteins now prized for their milk production and fertility. The horns are a remnant of their ancestry, and can actually be a problem now that the cows live on closed ranches instead of the open ranges of Asia. Even smaller horns can lead to injury to both other cattle and their human caretakers, and as such most ranchers and farmers will surgically remove them when the cow is young. One method involves cutting the horn buds off two-month-old calves with knives, wires or saws. The process is risky, as it leaves the calf open to infection afterwards. A preferred method, called disbudding, kills the horn buds at an earlier age, before they’ve attached to the calf’s skull. A hot iron kills the horn tissue without risk of infection, although the buds themselves are sometimes manually removed instead. While the latter method is safer, both concepts rely on proper administration of pain killers to keep the calf from being distressed by the process, but this may not always be done sufficiently. The cow-friendly solution to all this may be to breed cows to be hornless in the first place, saving all parties the ordeal of disbudding or dehorning, and making consumers happier about the source of their milk. The genes for hornless cows are fortunately dominant, so breeding for hornless offspring has at least a 50 percent chance of success. This doesn’t mean we should expected the end of horned cows overnight though, as selective breeding takes generations to really take hold (as compared to direct genetic modification, where each and every cow would have its horn-growing genes suppressed while gestating.) Farmers are also wary of loosing some of the milk-producing traits they’ve bred into the breed, as well as trying to expand the pool of hornless cows too quickly, resulting in inbreeding. Domestication is more than just feeding and housebreaking an animal. It also involves generations of genetic manipulation through controlled breeding, so that desirable traits, such as body size, hair, or even temperament can make the animal a better match to live with us, often to the point of dependence. We’ve made significant changes to horses, ducks, dogs and …cats? That last one isn’t so clear, actually. Our best guess is that we’ve lived with Felis Catus, house cats, for up to 9,000 years, although stronger evidence for how this relationship started is only 5,300 years old. As farmers in China improved their yields, they needed to store surplus grain, which of course attracted rodents. Who better to show up and eat those rodents than our new feline companions? (Although, when I posed this question to my kids, my two-year-old enthusiastically volunteered that he would be the one to eat the mice.) This all makes sense as an origin story for domestication, the problem is how little has changed since then. For supposedly domesticated animals, house cats are nearly identical to their wild counterparts. Genetic differences are minuscule, with the stripes of a tabby cat being a perfect proxy for those in the wild. Despite receiving food from humans, cats seem to retain all of their hunting instincts, sometimes decimating bird and rodent populations. We’ve made some small cosmetic changes through breeding, but nothing that matches the reshaping and dependence that say, a bulldog, has on humans. So are cats domesticated, or is this a relationship of convenience? One glimmer of a deeper interaction is being investigated in the genes governing cat (and other domesticated animals’) behavior. There may be an increase in these animals interest and trust in receiving rewards from humans, indicating that some long-term changes have been made. 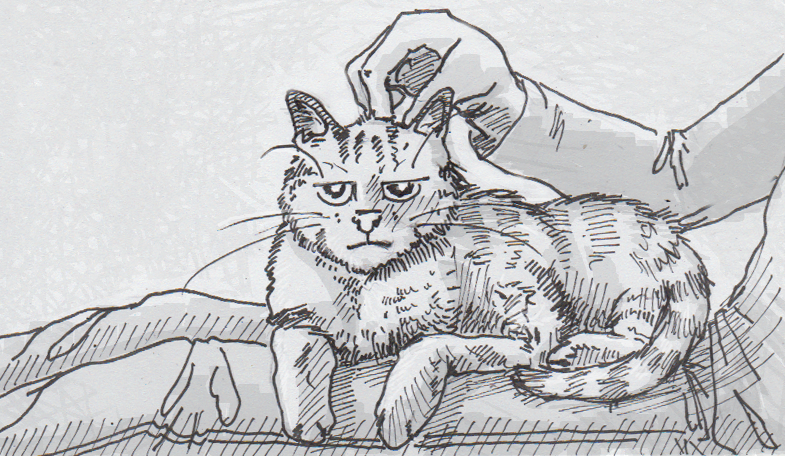 Even if we haven’t completely domesticated these animals by strict definitions, it seems that we’re probably devoted enough to wait for our cats to warm up to us a bit more. Daddy, why is some of your hair gray? Didn’t you say your beard used to kind of red like my hair? The first thought that popped into my head when asked this by my kindergartner the other day was “because of you, my darling!” I’m glad I didn’t respond that way though, because aside from being not wanting to be mean to by making my six-year-old feel guilty about what she did as a baby, I’d have been wrong. My children aren’t the reason I started finding gray hairs in around my temples and beard on my 30th birthday— my parents are. Hair coloring, like skin coloring, comes from the pigment called melanin. Cells called melanocytes sit at the end of the hair follicle as it grows, adding the two flavors of melanin to the shaft: eumelanins for blacks and browns, and pheomelanins for reds and yellows. While your scalp’s hair will have one recipe, your pubic, armpit and facial hair will have slightly different mixes, usually with a bit more pheomelanins for a lighter, redder color. The exact formula for your coloring is determined by genetics, as is the timing of when that formulation will break down. Hair grows in cycles, growing for three to five years at up to one centimeter a month, and then resting, and then dying and being shed. Each hair operates on its own schedule, which is how we avoid a yearly molt and instead have a generally even volume of hair on our head. As the hair grows, melanin is added to it, up until the end when the root is left white. At the end of it’s growth cycle, the melanocytes are sometimes damaged and die off, leaving no way to replace add melanin in future hairs growing at that site. The rate of melanocyte die-off seems to be primarily tied to genetics, rather than stress, lack of sleep, diet, etc., (although some hormones, drugs and diseases are known to speed this process up). Many people start seeing some gray around age 30, and by age 50 half of us will have lost half the color in our hair. Men usually have more gray than women, and people of European descent usually have more gray than people with African or Asian heritage. So just as your genes created your initial hair color, they’ll be setting up your second hair coloration too. Modern birds have changed in a number of ways since the Mesozoic era. Thanks to the slow process of evolution, birds’ genes have accumulated more and more differences from the last common ancestor they shared with other groups of theropods. Recent experiments have tried to identify the root of some of those changes in some chickens’ DNA, and then roll them back to their ancestral state. The targeted structure was the chickens’ beaks. Most animals, including more closely related reptiles and non-avian dinosaurs, have a snout made of two symmetric bones, called the premaxilla. Modern bird beaks, however, are a single, hard bone, attaching on both sides of the skull. This difference was thought to be at least partially due to the expression of two proteins when the embryonic bird was growing. So these two proteins were suppressed to see if the fused beak could be undone. It more or less worked. The resulting embryos (no dinofied chicks were actually hatched) weren’t drastically different on the outside, but they did have a couple of key shifts more inline with dinosaur anatomy. The first was that the beak was not fused, revealing distinct premaxilla. The second change found was to the embryos’ palates, which had grown wider and more robust, resembling the palates found in early theropods’ mouths. This doesn’t mean that we’re going to now immediately roll back millions of years of evolution and grow Tyrannosaurs from chicken eggs by blocking any gene less than 65 million years old. While two proteins made multiple differences in these bird skulls, there’s still a lot more to tackle if we’re to grow modern animals with ancestral structures (such as an ancient tail, which is being investigated already). When humans moved into Europe 40,000 years ago, it’s assumed they arrived with dark skin. It’s also been assumed that they quickly started selecting for lighter skin in their new, Northern climate. Then, the thinking continued, after figuring out farming, this population started propagating genes for lactose tolerance, taking advantage of milk from the newly domesticated livestock. But DNA studies of European populations have been unraveling this tidy little story, revealing a more complicated and more recent timeline. The genes researchers were looking for were those involved in a few different, and apparently discrete, traits. These included the LCT gene allowing the digestion of sugars in milk, SLC24A5 and SLC45A2, leading to pale skin, and HERC2/OCA2, which is the source of blue eyes, as well as possibly influencing lighter hair and skin pigmentation. And while it could have been possible to have all of these genetic changes sweep newly-settled Europeans all together, they seem to have come in multiple waves of influence from multiple sources. The new timeline starts with hunter-gatherers 8000 years ago, who were confirmed to not carry the LCT gene allowing lactose tolerance. This genetic variation wouldn’t take root until 2200 BCE, 5000 years after Europeans had been practicing agriculture. Two waves of immigrants that did bring many farming practices also lacked the gene upon arrival, indicating it may have developed in Europe. The advantage of consuming dairy went beyond gaining another source of calories- vitamin D was relatively scarce in Europe compared to humans’ original habitat further south, and milk products would have helped compensate for the loss of sunlight. The need for vitamin D likely drove the propagation of genes for pale skin as well. Darker skin blocks more ultraviolet light than lighter skin, which, when less sunlight is available at higher latitudes, leads to a drop in the body’s synthesis of vitamin D. So while Southern Europeans were had dark skin until at least 5800 years ago, populations in the north were found to carry genes for lighter skin and lighter eyes as far back as 7700 years ago. It wasn’t until farmers from the Near East, who also had genes for lighter skin, immigrated to Europe that these variations started to spread across the whole continent. So the piecemeal story of both diary consumption and pale pigments may still have the one common thread— vitamin D. While vitamin D does play a role in our immune system, other genes for immune response didn’t seem to be pressured or propagated in the European population in the same way, even with the introduction of farming, animal husbandry, and new populations. All that mattered was making up for the loss of sunshine.